January 10th is 'National Houseplant Appreciation' Day. I had picked up some tiny, miniature cyclamen at Vandermeer's, and since they are such an 'old-fashioned' houseplant, I thought they'd go nicely in a Victorian greenhouse. Then Elin and Nyssa interrupted her....."What are you doing??" "I'm trying to write some cards to my friends..."
"Could me and Elin write one to our friends too??" "Sure, you can each take one..."
March 21st is 'Flower Day', and it just so happened that I had picked up three miniature African violets at Vandermeer's recently. 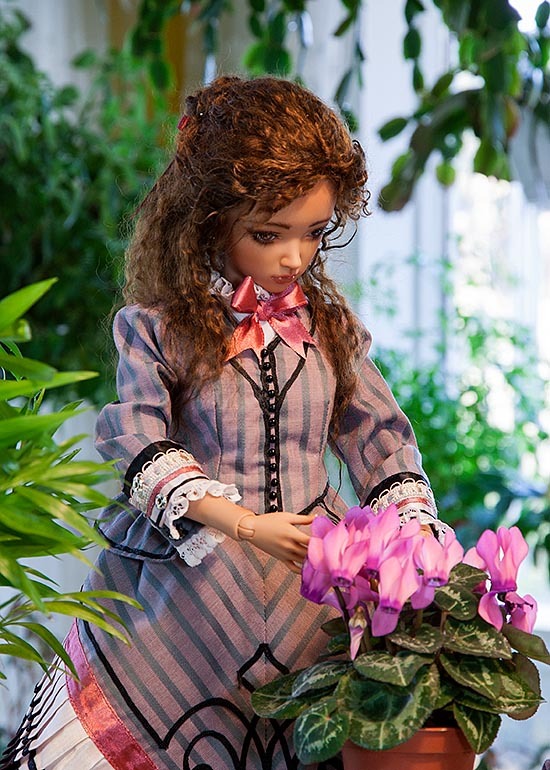 I like using real miniature plants in my doll photos, and the tiny cyclamen were almost done, so it was nice to find another tiny flowering plant.